Want to learn or advance your Yoga practice in a small, supportive environment? Tired of not being able to hit those tough poses or unsure if you're performing them correctly? Like the idea of getting hands-on technique help and adjustments to improve your practice? The Active Lifestyle is perfect for you. Our small Yoga sessions are strictly limited to 6 people. Sessions are adapted, progressed and regressed individually to suit the different Yogi's Levels. Every session has a focus on breathing and meditative aspects. 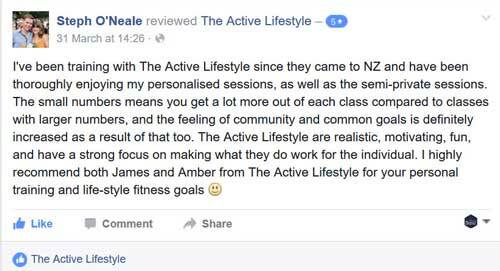 Our private members only training studio in Mt Eden, Auckland has a welcoming and enjoyable atmosphere. Learn from a Yoga teacher who is fully accredited in both Yoga teaching and personal training making them an expert in body alignment and body awareness. Be an inspiration to your children. On site car parking takes the stress out of visiting our studio. We care about your Yoga progress and our sessions reflect that. Sessions run Monday and Wednesday evening at 615pm and Saturday morning 830am. Amber went down to ZM Radio to help teach Jase and PJ from ZM some Yoga!